I just completed subject replacement on Gray Ghost and Silver Bullet. This is to pass on some tips and encouragement. Since BOTH of these puppies came out more clogged than a shower stall drain screen, I'd add this work element to your increase-in-performance checklist (valve adjustments, banjo bolt and line cleaning, etc.) Suggest adding it as an R&R action at least every 30K miles. Schedule the job when the fuel gauge reads below 1/4. That should be about 5 gallons or less left in the tank. The R&R job should take about an hour. 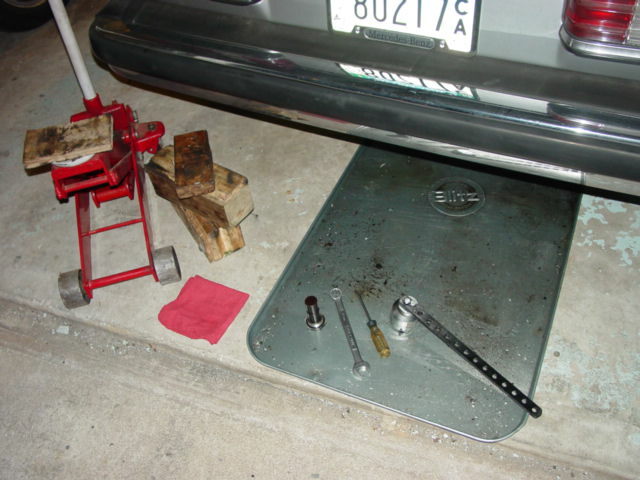 Use a large drip pan to catch any wayward diesel. 1. Safety. I work in my garage on a solid, nearly flat concrete floor. Safety glasses REQUIRED. As mentioned, I used a 3'x5' shallow metal drip pan. Advance Auto and other shops. 2. Blocking the L/F wheel, jack up the R/R lift point about 10" (+/-). 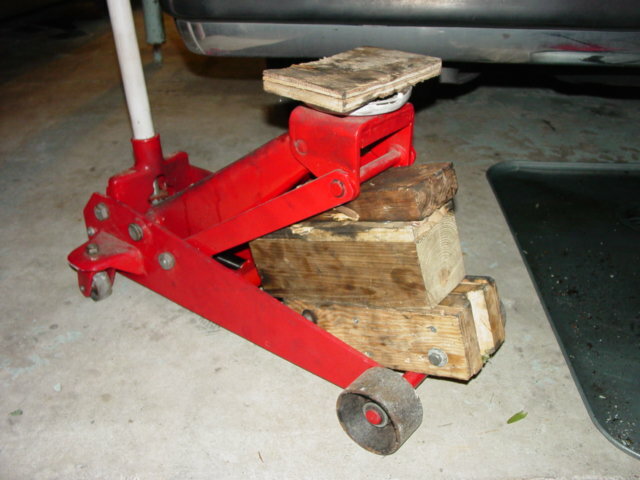 I use a hydraulic shop floor jack -- the one on wheels, not the vertical cylinder type. I place 12" lengths of 4x4 and 2x4 lumber horizontally (nearly) between the lift arm and the front jack axle, then lower the vehicle, "crushing" the dunnage a wee bit; very stable. You may wish to add a jack stand. 3. Shop light so you can see; clean the area around the screen base, the fuel hose to the hardlline, etc. 4. Test position a plastic jerry can so that the filler spout is 3 inches below the bottom of the hex filter screen base. Mine, a 6 gallon can, fit perfectly; use wood blocking, etc. to get yours up close. 5. Move the can. Note that the hose has been twisted or coiled similar to a pig's tail (and has been on the vehicle in this position for some time). Note the clearance between the hose and the right half axle. 6. With a #2 Phillips screwdriver loosen the hose clamp, unscrewing it to the end, just before the screw falls out; expand the band; push the clamp up on the hose. 7. About 1/2" of fuel hose is fitted over the hard line. Gently, and with FULL control, rotate the hose back and forth SLOWLY. Pull it back 3/8", almost off. Note the now exposed rib on the hard fuel line. 8. Get ready. In one, smooth motion, you will have to remove the hose the last 1/8", stopper up the end with your thumb, move the jerry can back into position, uncoil the hose, and insert same into the mouth of the can. (Alternately use a short piece of copper tubing -- 1/4" as used on a refrigerator water line -- and maybe some 1/4" ID hose as an extension). 9. If positioned properly, the hose will stay in the can, draining the fuel all by itself. If so, get up and open the vehicle fuel filler cap, relieving the vacuum, and allowing the fuel to drain much faster. I put a shop light behind my plastic jerry can to monitor rising fuel within; should be fully drained in 10-15 minutes. 10. Remove the hose from the can and expect it to drip, drip, drip into the pan. Cap the can and move to a safe area. 11. Note the work area is pretty close quarters. 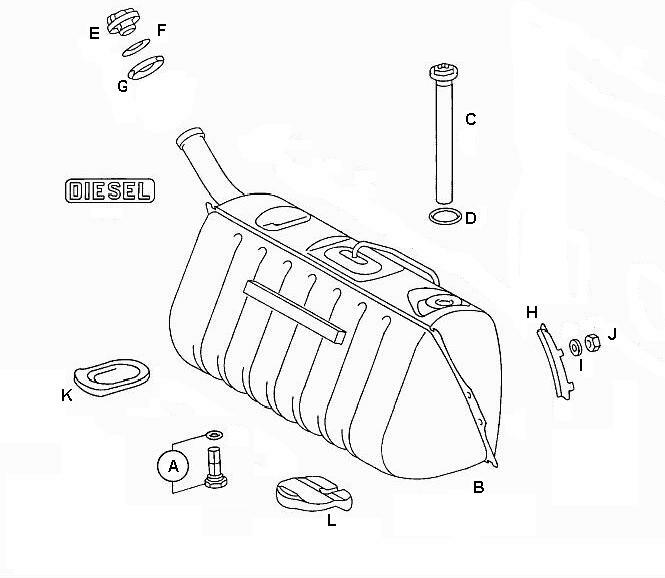 Use a 19mm open end to remove the rubber fuel hose from the hex base of the filter screen. Expect more dripping. + Sears Craftsman socket 46mm (1-13/16") Part # G-47786, unfortunately 3/4" drive. 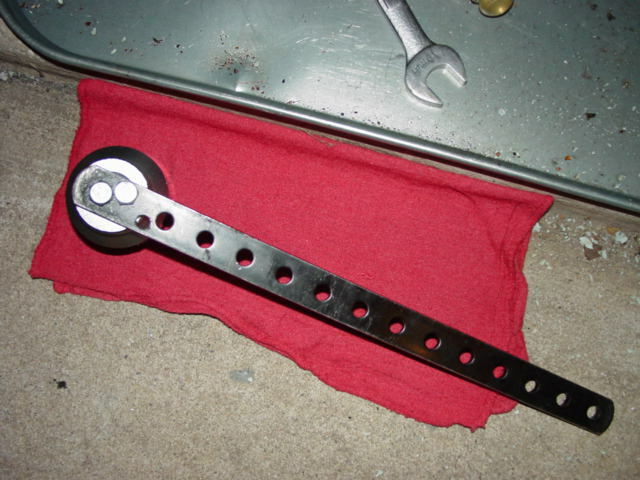 + Scrap flat bar stock 1"x15"x1/4"
+ Couple of nuts, bolts and a fender washer from the junk bin. + Drill a couple of bolt holes on one end of the bar stock, just far enough apart so that the outside of two bolts fit the diagonal of the 3/4" drive opening. Assembly vertical dimension is 3-1/2" and fits perfectly. 13. Note the area around the hex filter base. It probably has rubber sheet or gasketing material and a thicker insulating pad going right up to the base in one or more places. I used a utility knife and cut a 1/4" cleared area all around to allow the socket adequate mating surface. 14. Have the new filter screen and O-ring ready where you can reach it. 15. Appliying about 30 pounds of force on that 15" handle CCW enabled me to move the screen base maybe 5 dgrees. New bite, 5 more, etc. Soon it was finger loose. 16. Expect a small deluge of diesel when you remove the old screen. Have the new one ready to install BUT be very careful starting the thread. Expect your arm to run with diesel. I used a surgical hose and tied it off just above the elbow. The diesel ran down my forearm, hit the hose, then found its way down the loose ends to the drip pan. 17. Finger-tighten the new screen til the O-ring hits the bottom of the tank, then add 1/3 turn with the socket-bar widget. 18. Carefully reinstall the hose, ensure the clamp is still on it and push the loose end on to the hard line up to the formed ring. 19. Dispose of all waste diesel responsibly. If your drip pan started clean, you could decant the waste through a layer or two of gause filter (clean rags) and pour it back into the tank. 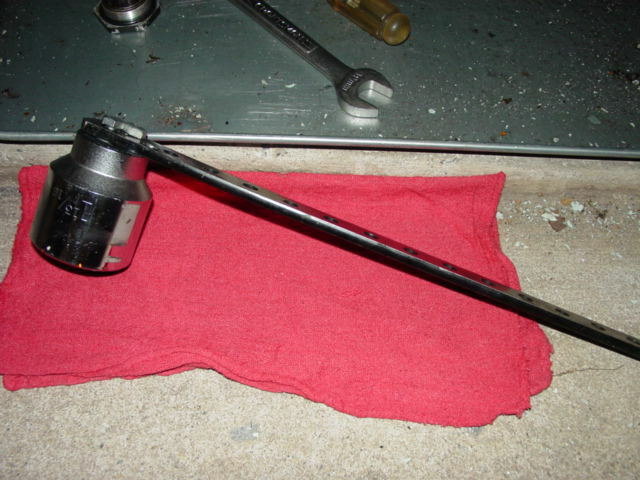 Five pix added: a) tools of the trade; b) hydraulic jack with dunnage; c) 46mm socket with handle; d) view from top (note bolt heads); e) view from within socket (note fender washer). The old filter was 95% blocked, easy. I strongly suggest including this change out as standard maintenance and BEFORE adjusting the ALDA (as some sort of magic pill solution). Gray Ghost with a new filter, a dog before, now cruises the interstate with four passengers, AC and no lagging. It works great. Do it. Great description. Should be posted in the DIY section. You couldn't take any pics with diesel dripping down your arm? ;-) Thanks. Great write-up. Love the drip tube idea! As a possible alternative for those high-mile cars that have never replaced the screen, its not that too much more difficult to remove the tank entirely. Two benefits from this: 1 - you can wash out the tank and 2- with the tank out, a big pair of channel locks or big adjustable wrench can take off the tank screen nut. Last edited by grindMARC; 09-07-2007 at 11:22 AM. Thanks for the comments and references. I added some notes and five photos. Good luck with your screen changeouts. Having a sack of the cheap kitty litter on hand to catch what does spill is also a good idea. In the TD there is an internal socket that is about 1-1/8 in (30 mm?) and differs from the sedan, at least thats what I remember its been over 12 years ago that I had a case of algae. I used a strong dose of RedLine Diesel Catalyst too with the Biostat to help loosen up any algae that remains in the tank. I used a plumbers basin wrench to remove the tank filter. 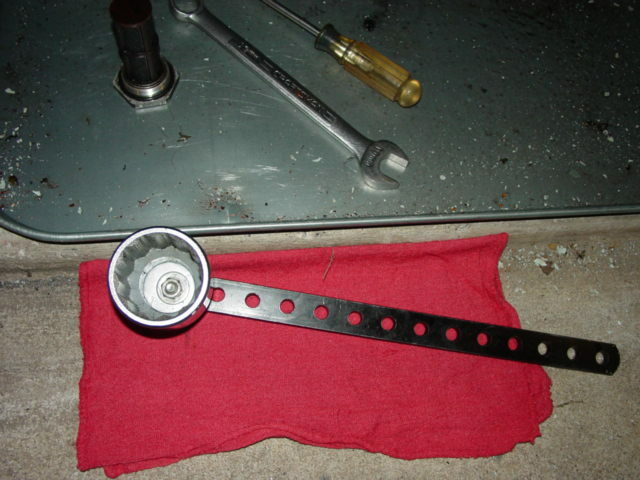 A basin wrench is that funny looking adjustable wrench that opens to about 4", so after you fix your car, you can fix your kitchen sink. Home Depot sells the wrench for less than a socket, and I believe I also used it to remove the fuel sending unit at the top of the tank. There is little or no torque to put in the strainer or the sending unit, so they are relatively easy to turn. Wow! Talk about 10 year revival! I did mine backed up on ramps. Forceps to clamp the fuel line then a dual barb fitting to a hose to drain into however many fuel cans needed. Then a jack under the differential, pull 2 bolts from the mount and lower the jack just enough to access the filter with ordinary socket. No special tools needed if you pull 2 bolts.